We are a trusted partner providing engineered solutions, services, and manufacturing to the commercial sector, U.S. Department of Defense, and NASA. We collaborate with you to deliver innovative solutions that support the development and application of practical, cost-effective systems that meet challenges—from the routine to the extreme. Our experience and expertise across multiple industries uniquely positions us as a leader in the military and defense services markets. Our products and services meet the rigorous demands of the complex environments in which they operate, delivering results with uncompromised safety and reliability. Our Marine Services Division has over 30 years of experience in providing full-service ship repair capabilities for U.S. Navy vessels including submarines, surface ships and craft, and deep submergence systems. Operating from state-of-the-art facilities in Chesapeake, Virginia, we are certified in SUBSAFE and DSS-SOC repair activities and specialize in the design, repair, maintenance, modification, and installation of hull, mechanical, and electrical (HM&E) systems. We perform high-consequence maintenance on assets that operate in demanding environments. Global locations and certifications enable us to meet even the most time sensitive and critical schedule deadlines. Oceaneering Technologies (OTECH) designs, builds, and operates unique maritime and specialized systems for government, military, and commercial customers. Engineering expertise coupled with extensive offshore experience enables development of pragmatic solutions and delivery of reliable systems. We specialize in the design of equipment operated in harsh environments by engineering solutions that effectively manage the impacts caused by bio-fouling, corrosion, and long term exposure. 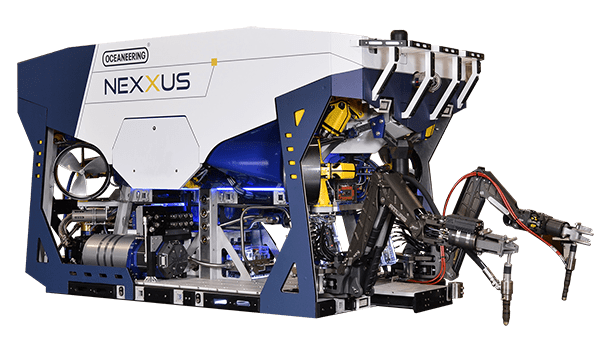 Oceaneering Space Systems (OSS)—which is ideally located near Johnson Space Center in Houston, Texas—develops, integrates, and applies new and established technologies to meet the challenges of working in space and other harsh environments. We have provided the U.S. Department of Defense, NASA, their contractors, and commercial launch vehicle providers with space flight hardware systems and equipment for more than 35 years. Our capabilities cover a broad range of products and services including space-based robotics and automation, satellite servicing, human space flight systems, and thermal protection systems.